Before social media, you made films for an audience. Now, when you take advantage of all the new social media tools, you make your audience a participating community in the creation of the film. With crowd funding, their donations represent their approval of your concept. When you get a Facebook page, their likes will tell you right away if you are on the right track. If you tweet and get retweeted, that is sweet and you know you’ve got a chance to make your film. When you decide to make a film, setting up your film’s web site should be the first priority. It’s much easier today with one of the new Content Management System (CMS) sites. WordPress is free. They allow you to make changes constantly and upload information yourself. Top items for the site are a BUY NOW or DONATE button if you are working under a fiscal sponsorship such as a non-profit like From The Heart Productions. Link your page to social network sites like Facebook, Twitter, and LinkedIn. Have an opt-in box on your site to collect names, emails and zip codes. Create a blog on your website for search engine optimization (SEO). Keep your site clean, easy to read, and easy to navigate. Most sites set up by filmmakers give something away to encourage people to leave their personal information in the opt-in box. It should be something pertinent to the movie so that those contributing feel as though they are part of the project or at least getting a tangible piece of it. Put your opt-in box on the top right side of the site and make accessible in as few clicks as possible. Blogging is a key marketing element. Having the blog on your own site is best. You want those who read the blog to stay on your site. But, many of those filmmakers who use From The Heart Productions as their fiscal sponsor use Tumblr.com. You can set up your blog there, add photos, and link you blog to Facebook so each blog gets posted on your Facebook page. A weekly blog keeps people coming back to your site for current information on the subject of your film. It is your best way to create a community around your film. Search engines such as Google pick up the titles of the blog so use the key words of your market in the title. 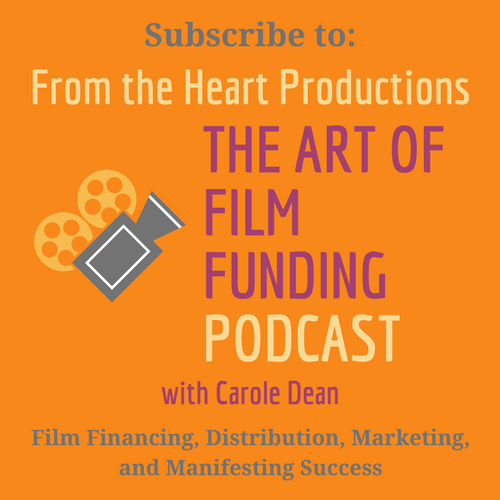 This is the new way to market your film, through a community who is interested in the subject of your film. BlogTalkRadio.com is a wonderful new free service and I recommend a 30 minute show. You can interview your cameraman, your actors, and give your audience a touch of Hollywood. I created a show with interviews from my film book and was flabbergasted at the number of listens with very little marketing. When building your Facebook page, use the same typeface, logo and colors as the web site so you are branding the image of your film. Try to use colors and type face from your one-sheet art work that you also have on the web site. Any updates to the web site should be linked to Facebook so that readers there will be notified to look for new information on project. Facebook is an important marketing tool. Miramax has launched 20 movies for rent on Facebook. You might watch their strategy and be ready to use it to sell your film. You want to get your friends on Facebook to go to your web site and opt-in to add them to your community. Post incentives on Facebook to get fans to your site. Fill your Facebook profile with all your awards and achievement. Facebook organizes by interest so you want people with similar interests to find you. Each time you update your profile it notifies your friends. Make sure you post a link to your blog articles on your page. I’ve seen some good results attracting fans by using Facebook ads. A good ad line to lure fans usually contains a question. For example, write “Do you like?” and then add your genera or your subject. “Do you like Shakespeare?” was a successful ad that filmmaker Jilann Spitzmiller ran for her documentary, Still Dreaming. Rather than tweet directly about your film , use twitter to create discussions about subject matter. If find a good article relating to your subject, retweet the link. Jon Reiss in his book, Think Outside the Box Office, says that you should routinely conduct searches on Twitter for your name. You want to know what people are saying about you. You can use client programs like TweetDeck or Tweetie that supports saved searches to find saved information. Now where’s your community? Sure, it’s easy to set up these sites and services, but how do you make people come visit them? One of the most fatal mistakes my filmmakers make is that they think that once they’ve set up a website, a Facebook page, and tweet until their thumbs are red, their work is done. They think people will just flock to the site. No, it’s your job to find them, collect names, and begin the buzz about you and your film. To find your audience, ask yourself, “What is your unique selling proposition?” (USP). What is the subject of your movie? Are there online or print magazines on the subject? If so, those subscribers are part of your market. Start an internet search. Go online and use Google Keyword Traffic Estimator, put your key words in quotes, like “Swimming Movie,” submit, and look on the left side for a box saying EXACT and click on that for your search data. Consider all markets. Does it fit the women’s market or the new age market or environmentalists? Is it a horror or vampire movie? Discussion groups for all these tastes are waiting for you to join them on Facebook, LinkedIn and in Yahoo Groups. That’s where you can find and drive people to your site and Facebook page. Join them and participate in discussions related to films and your subject. You will create trust and interest relating to your subject. People will then seek out you and your project. Use emails to communicate with fans quickly. Blogs are good, but newsletters work great when you’ve got your campaign going and want to keep your project directly in front of your audience. I use Constant Contact to keep my followers and donors apprised of the latest developments for the films I sponsor. I know all of this in one go sounds overwhelming and it probably ISN’T for anyone but our Fearless Independent Filmmakers. I have seen you achieve the impossible so I know you can do it. The potential rewards are great, you are in charge of the incoming money and you keep your customer base. Think like your audience, and keep asking yourself, “What’s in it for me?” When you do this, you will find some wonderful gifts for your fans. Your concern for them will be returned to you tenfold.